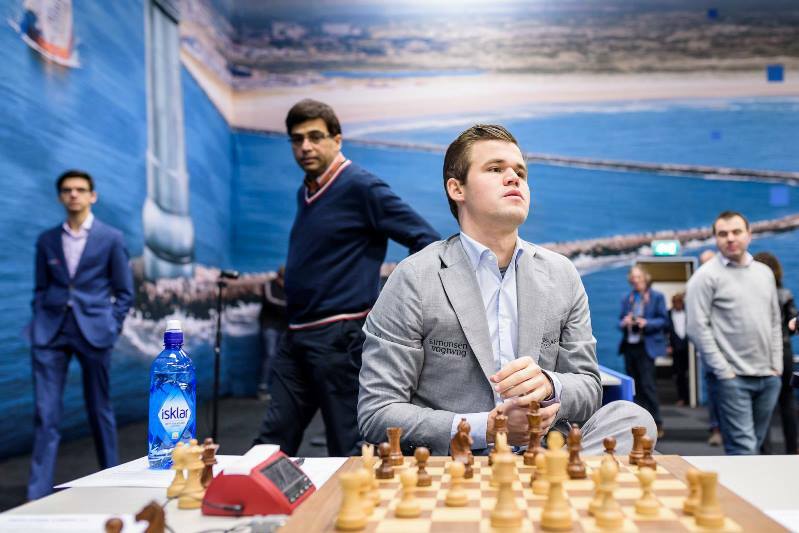 Magnus Carlsen has won the top tournament in Wijk aan Zee for a record 7th time after drawing the final game against Anish Giri to finish on 9/13. He described his performance as “very professional” if not “sparkling”, but apart from Giri no-one ran him close. With little left to play for there were draws elsewhere, with only Jorden van Foreest and Vladimir Kramnik committing different kinds of chess suicide to lose to Richard Rapport and Sam Shankland and finish in last place. Vladislav Kovalev will play the Masters next year after winning the Challengers with a brilliant 10/13. If you’re not nervous before such a game you’re not human. I was a bit nervous, but once the game started it subsided. …) so Anish needed to win with the white pieces, and he repeated the 7.Bg5 line against the Sveshnikov Sicilian played by Teimour Radjabov against Magnus two rounds earlier. I thought 14…Kh8 was a mistake that he made that time [against Radjabov], so I didn’t expect him to repeat. Giri played 15.Bg4 instead of Radjabov’s innocuous 15.a3, but then began to have doubts about his intended line and changed track, only to find he’d miscalculated and was heading towards an exchange sacrifice that promised only equality. He decided to throw a spanner in the works with 20.Be2!? After 19…Bc6 I’m supposed to take on a6, obviously, but he was sitting there so eager to go home that I thought, ok, how can I keep him sitting here? And I went for this insane 20.Be2! ?, because I went to a position that I knew, like with three tempi down, but my logic was that ok, in that position I’m ok, and maybe here I’ll somehow survive. I was a bit surprised that he went for this. It isn’t that easy for Black to play, but I don’t know exactly what his intentions were. His exchange sac is, I think, a bit desperate. If anybody’s better after that I think it’s Black, but I didn’t particularly look for it, seeing as I had a safe continuation in the game. I started a bit slowly but obviously +5 over the last 9 is very good and generally my level of play has been stable. It hasn’t been sparkling, but it’s been good. Stellar technique and grinding out wins is what first brought Magnus to the top, and it seems he’s keen to get back in the groove. 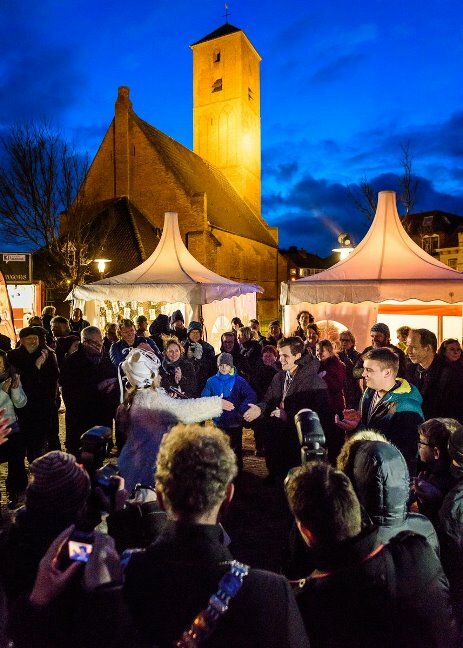 We’ll have to wait a while, though, since Magnus said his next confirmed event is the GRENKE Chess Classic in late April (from our live commentary we know Peter Svidler will be playing there, but we can expect the likes of Fabiano Caruana and Vishy Anand also to be involved). I’m very happy about the finish and it’s probably my best result so far in the A Group, so I can’t complain too much. He lost only to Carlsen and Giri and played perhaps the move of the tournament in the win against Duda, but he admitted there had been some great escapes along the way, most recently in the previous round against Vidit. This game was a quiet Berlin draw between two players who could be relatively happy with their performance in Wijk aan Zee. Ian Nepomniachtchi got off to a flying 2.5/3 start, made a series of draws, but then seemed ready to push for more when he also beat Vidit in Round 9 to reach +3. Disaster struck in the next round against Jorden van Foreest, however, and a crushing loss to Sam Shankland in the penultimate round removed all title hopes. He still finished joint 3rd, however, and the rest of the field was spared the humiliation of being conquered by a player who felt he was at death’s door for much of the event! Teimour Radjabov proved he remains a top class chess player, despite barely playing in the last couple of years. 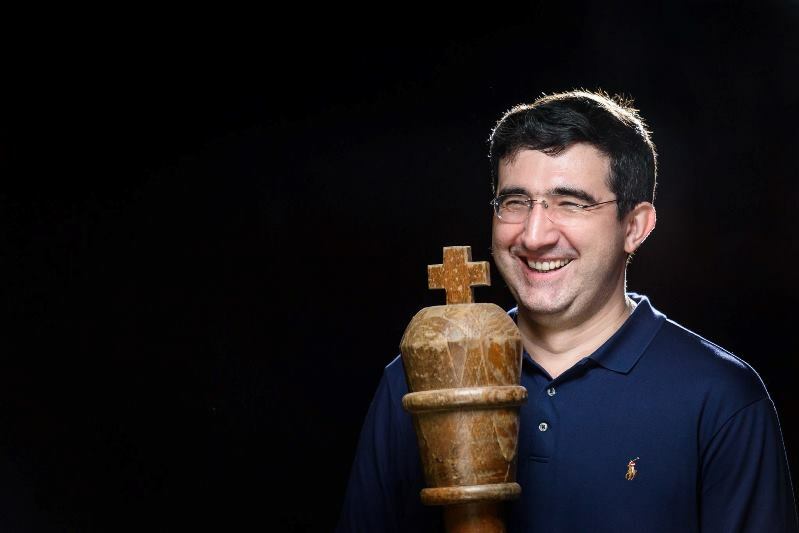 His only defeat came in a drawn endgame against Fedoseev, but he only picked up a single win, with rustiness perhaps behind some near misses - Round 1 against Kramnik and the draw offer against Giri in the penultimate round immediately spring to mind. He finished on 50%. 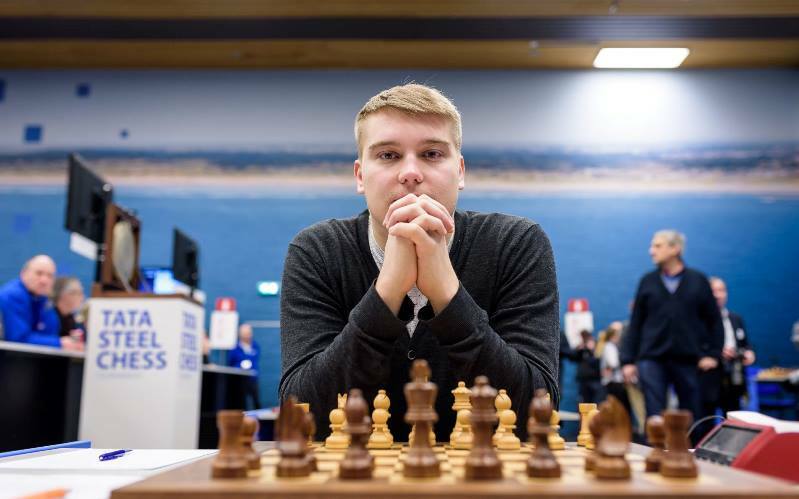 Despite wins over Fedoseev and Kramnik and an overall decent level of play, the tournament must go down as a missed opportunity for 20-year-old Jan-Krzysztof Duda to really make a name for himself in classical chess. He suffered four losses to finish on 5.5/13 in 10th place. I like Ding, he’s a great player, but then on the other hand I had some fun in our little match in St. Louis, and his streak and his results recently speak for themselves, he’s doing great, but I think he himself would admit that he hasn’t really proven it in the very top tournaments yet. I think he’s eager to get the chance and prove his worth. In the last Candidates he showed that he could fight on equal terms with everybody, but he didn’t really show anything more, and I think he’s certainly eager to do that. Whether he will – I remain sceptical until I’m proven otherwise. Ding Liren still has something to prove, even if he's now the world no. 3. Vidit’s first classical game against his great contemporary went well, as he played the Petroff and made a 30-move draw from a position of strength, and in general both Indian stars could be pretty happy with their tournaments. Anand was the other player to finish in the tie for third place on +2 (7.5/13) after a tournament that included back-to-back wins over Kramnik and Mamedyarov. The one shadow cast over the event must have been painful - losing a drawn ending to Carlsen – but as Svidler summed up when looking at the 49-year-old’s result: “we’re lucky to live in his era”. 24-year-old Vidit finished just half a point back and gained 16.2 rating points to secure a deserved place back in the 2700 club. 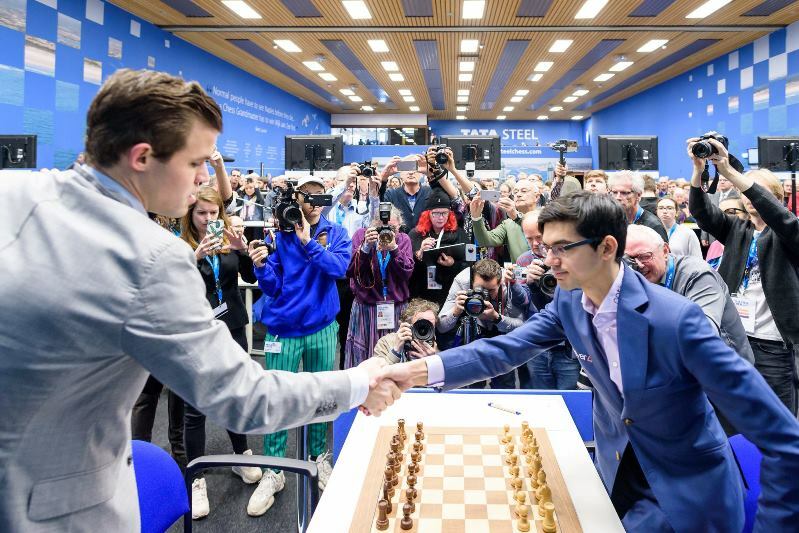 He joined Vishy in beating Kramnik and Mamedyarov in consecutive rounds and might have emulated his great compatriot’s result if he’d won a won position against Rapport in the next game. 6th place was a fine debut in the Tata Steel Masters. Shakhriyar Mamedyarov had lost to Carlsen, Anand and Vidit, which is the kind of thing that can happen even to a top player, but after winning five games in the 2018 Masters he finished as the only player not to win a game in 2019. A couple of years of almost uninterrupted success came to a crunching end for the Azeri no. 1, who lost 27.3 rating points and dropped from world no. 3 to world no. 5, a potentially crucial development since there may be only one ratings qualifications place in the 2020 Candidates Tournament. It’s tempting to put the result down to losing a drawn ending against Magnus in Round 6, but even before that there was no spark to Shak’s play. Is fatherhood taking its toll? Vladimir Fedoseev, meanwhile, couldn’t be criticised for a lack of ambition. He won two and ultimately lost five games to end level with Mamedyarov on 5/13, but his almost successful grind against Carlsen was one of the most memorable games of the event. 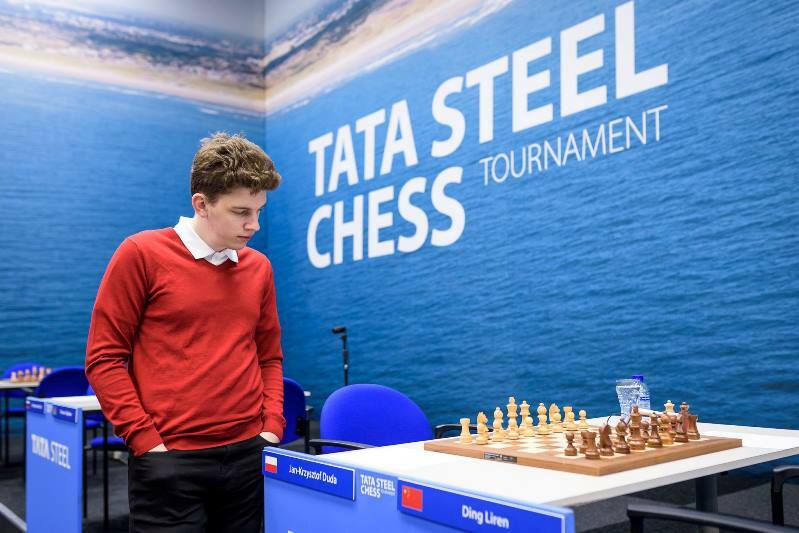 Inspired by that he went on to beat Shankland and Radjabov in the next two rounds, but hopes of fighting for the top places were crushed by losses in the next three games. Fedoseev perhaps needs to work on a Plan B for when all-out aggression isn’t going well. I’m an old man, I just want to enjoy chess. Of course I know I’m overstepping limits, but I do it absolutely consciously. I know I’m risking too much, but that’s the way I want to play. In such a strong tournament it maybe doesn’t pay, but at least I have interesting games! But how much could anyone enjoy games like this? Once again Vladimir may need to do some serious reflection before future events, but there is an incentive. Changes to the World Championship cycle have given a boost to his chances of getting one last shot at the title. 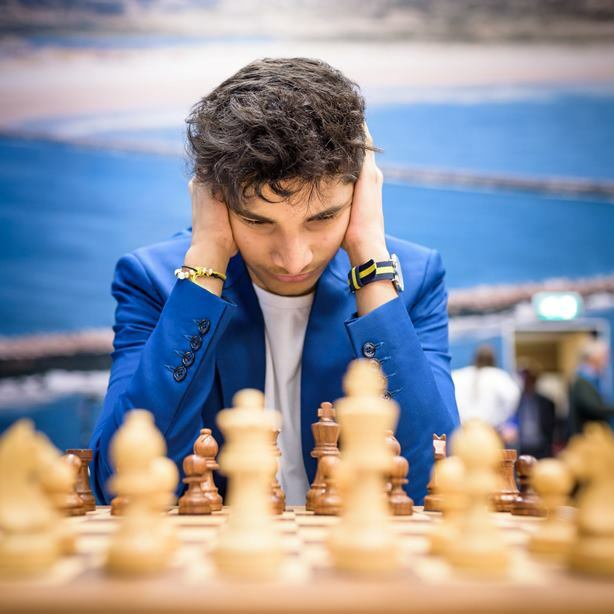 He never played in the arduous and underfunded Grand Prix events before and has no chance this year of qualifying by rating, but it’s easy to imagine him willing to play in the new knockout Grand Prix series, World Cup and Grand Swiss. For Sam Shankland, meanwhile, the outcome of the final game was a rich reward for going for a dicey bishop sacrifice at the end, and meant he ended his super-tournament debut on 50% in joint 7th place. He’d gained not just experience but rating points and could arguably have done even better. The only lingering question is how long it will take not to wake up in a cold sweat over resigning a drawn position to Giri! 23.Bxh7+! Kxh7 24.Rg4! and Black resigned, since 24…f6 runs into 25.Rh4+! Kg8 26.Qxe6+ Rf7 and White can choose a win. So it was an utterly deserved first place for Vladislav Kovalev, who scored an unbeaten +7 for 10/13. In consecutive years the 25-year-old from Belarus has now earned a place in Dortmund (winning the 2018 Aeroflot Open) and the 2020 Tata Steel Masters. He’s also pushed his rating up above 2700, a trajectory that should eventually see him gain some super tournament invitations rather than always having to do it the hard way! 34…Nd3! was a spectacular try, with Peter Svidler hugely impressed by the idea of 35.exd3 fxg3! 36.fxg3 e3! and suddenly, with the dual threats of Qf2+ and e2, it’s White who has to play carefully to draw despite the extra piece! Instead after 35.Qd6!? Bareev went on to win in 43 moves. 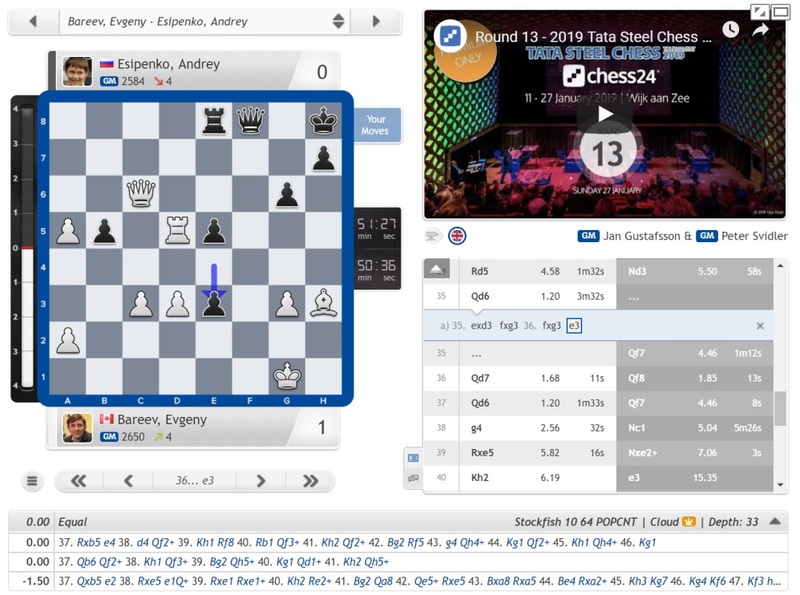 So that’s all for the 2019 Tata Steel Chess tournament! We hope you’ve enjoyed our coverage, and fortunately there’s no need to despair about a lack of top-level chess. The Gibraltar Masters is entering the finishing straight, with the action beginning at 15:00 CET each day.